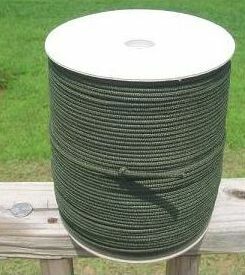 Hobby Lobby has some really cool nylon seine twine. It is #18 and twisted, but comes in way cool colors. I will get some and make a new sling soon. Probably an 8 strander to get full use of the colors. Could you provide the web address. You can get spools of military surplus parachute cord in several colors (tan, olive drab, black, and a few more) pretty cheap. The great thing about paracord is that you can melt the ends to get a nice fray-resistant termination. 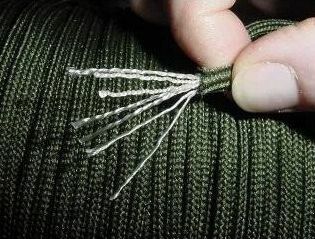 This is what I use for all my slings. It's super strong for it's diameter and weight, and doesn't irritate your hands after extended use. Actually, I could sell you 50 foot sections for like 5 bucks if your interested. Thanks Chris, but I have access to all the cord I need at the moment. Para cord is great stuff, but a little big for my sling making style. Parchute cord is available a reasonable prices in a plethera of colors (30 to be exact) from ubraidit.com. Not as cheap a mil surplus, but in exciting colors to make up for it. Hobby lobby is at hobbylobby.com. I don't know if the web site has all their stuff, but the store is full of cool things. Chris - once I have a couple more dollars in my pocket I'll take some paracord... I'll shoot ya an email soon. Awesome websites man. I am very excited to see your new sling when you get it done! My red sling in the gallery is done in 8 plait with a 4 strand core. I did black, off white, black, red. I love that combination but I've been partial to the black off white combination lately. I saw a Peruvian sling that had a good amount of orange in it. That was interesting. But my favorites are black and off white or black and wheat color. There are so many ways to arrange the strands in an 8 strand braid, let alone color combinations. Post some pictures when you get it done. I'm drooling! Why buy it when you can braid it? Thanks for the close up pic on the cord. I know how to do that braid. I'll braid you some really nice paracord for $300 a foot. Any color you want. Just get me the materials, the money, and a few months and I can braid you about 10' worth. I can, it just takes time and materials..., and $3000. Anyone interested drop me a line. 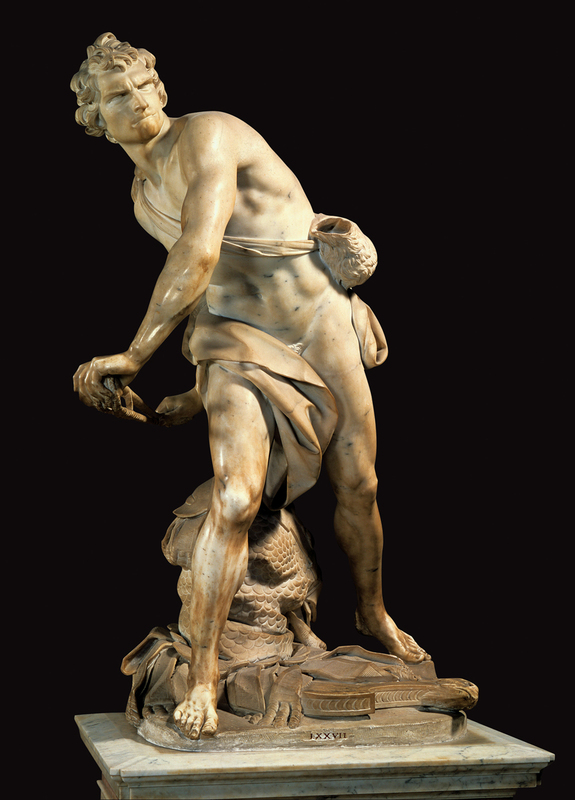 I just read about those dudes that could sling a stone with right or left hand in 1 Chronicles 12 tonight. Pretty bad dudes! I like their names. We are really lacking good movies to potray "mighty men of valor," as they are called here. I could just dream of watching a movie with that many slings in it! Of course we are men too; who needs movies. You are a great guy, to offer your handmade work at such reasonable prices! I may be a little while until I get a new sling made. I am shooting my new bow a lot right now. Making a bow for my 8 year old and one for my wife as well. Throwing sticks is really my favorite activity. Yeah, slings are fun, too, though. I will be helping teach a group of boys about archery this Saturday. I will also introduce them to the sling. Great fun! I really love the colors Hobby Lobby has in the twine. I intend to make something subdued but rich; like maybe bronze and tan, or burgundy and tan. I have lots of leather in various colors, so I should get a great looking sling out of the deal. I love making slings with the plaited cord. They look great, throw great and the work is theraputic for me. I am also still thinking about that really simple sling for the website. Lots going on in my head and at my house. The colors on the site are very cool. I'd love some neon orange paracord. The prices are good too, although I didn't check their shipping cost / min order. Ben, Im glad you offer a discount to your fellow slinging.org'ers. Perhaps I could give you my life saving when I retire for a a few feet? Should I wire it to your swiss bank account or do you take a extra long check? Jeff, are those boys by any chance scouts? I ask because I get a surprising number of people emailing me about showing their local scout troops about slings. Let me know if you want 50 foot sections of paracord. $5 should be sufficient to cover shipping too. That pic does'nt happen to be the San Juans??? Iused to live in Durango and have been backpacking there the past two years.